CHASING FOOD DREAMS: Northern Claypot Seafood Porridge, Kota Kemuning: My Affair with The Sultan! Northern Claypot Seafood Porridge, Kota Kemuning: My Affair with The Sultan! It was a Fishy Affair! My loveable family of gluttons took me to a restaurant they discovered recently. Northern Claypot Seafood Porridge, located in Kota Kemuning, is a no frill restaurant serving northern comfort food. As the name depicts, their specialty is seafood porridge and seafood, especially upper stream fresh water fish. Northern Claypot is dressed to the minimalist with bright and clean ambience and air-conditioned. Menu is pretty straight ward with pictures and choices are decent. Signatures are Teochew porridge with various choices of seafood and meat, steamed fresh water fish & seafood, curry fish head, seafood steamboat and some choices of home cook dishes. In the kitchen, Chef Beh who hails from Taiping uses his family’s fisherman background as the platform for his dishes. Cooking from the heart, he churns out home-style dishes with much simplicity, focusing more on the freshness and quality. Prior to this congregation, we had actually savor the awesomeness of the Teochew porridge and a fabulous Steamed Patin Buah a week before and decided to return for more. After chatting with the owners, Mr. Yeoh Kim Hooi and Mr.Ng Kok Chan, (who happen to be there and was happily talking to their guests) our conversation somehow led to the discussion that they can get their hands on a fairly rare fish royally named Sultan Fish. And thus, our return was nicely scheduled with much anticipation for the fish. How much would you pay for good fish? And we are not talking about normal fishes but rather highly prized river fish. Would you ever lust after few of the most expensive Empurau, Tengalan, Sultan or Kelah Merah? We should thank our lucky stars that our country is rich with an abundance of fish. With over 700 species of fishes in our sea line and 360 species in our rivers and lakes (I read about this information from here). That’s a whole load of fishes to try! Anyway, I have never savor a Sultan fish before, hence I was super curious as to the quality of the fish with a hefty price tag. One phone call confirmed that they are able to lay their hands on the fish and we congregated at Northern Claypot Seafood Porridge last Saturday to taste the fish. Oh course, one does not live on fish alone in my family of gluttons. My dearest sister contributed abalone and Australian abalone top shell to amped the meal. And so we braced out stomach for quite a few dishes that evening! It’s not exactly the popular abalone but its relatively related to the same mollusk family. We decided to have the chef whipped this up Kung Poh style because I had tasted something similar at another restaurant. It’s not as firm and chewy as other mollusk I had before, in fact, it’s strangely soft. I am not that fond of this abalone top shell’s texture but the flavors of the Kung Poh are decently good. Dark, thick, savory, sweet with a little hint of heat, the other ingredients added more body to the dish. Simplest ingredients always bring back childhood memories. Mom used to make this a lot for me when I was a kid. Eating Minced Meat Steamed Egg was utterly pleasant and comforting. I like that they drizzled a little garlic oil on top. Another favorite childhood dish mom makes and I would be the first to ‘Jom’ a big batch for my tummy. The version here is delicious. Crisp coating and moist filling of the minced meat makes these little babies easy for popping. Savory with a light note of meaty sweetness, these would definitely go well with a nice beer! I love Teochew porridge! Like seriously a lot… its pure comfort food that always manages to sooth my troubles away. We added extra fish balls and the can of abalone. The broth is very delicate and wholesome, summing up the grainy porridge in a hearty note. The bits of crispy pork lard oil and coriander pumped up the aroma and flavors beautifully. I would have been just happy with the minced meat as the soft grains of porridge matches really well with the light porky minced meat. The opulent abalone does not provide much taste but it added a good texture to the porridge. It’s funny how a simple porridge with minced meat can exude pure bliss! One can also order the same Teochew cooking style with rice noodles and there are plenty of choices of seafood to choose from. Their signature is a Four Treasure Porridge with fish, prawns, crab and cuttlefish. One can also order each type of seafood individually or add additional ingredients like fish maw, white pomfret, lala, fish ball, scallops, asparagus clams and abalone. Sufficiently succulent, the Fried Prawns retained their natural sweetness in every bite. The prawns were firm, showing signs of freshness while seasoned well before being fried. I had the Salted Baked Prawns last week and seemed to prefer that one because of its aromatic flavor through the salt bake process. Ah… the star arrived! Cooked the same way as the awesome Patin Buah fish we had last week, it certainly had an appealing look. We ordered a part of the fish from the tail section. Steamed with wine, ginger, chili padi and crispy pork lard, the flavor combination is quite lethal and spectacular. Savory, spicy and gingery, the fish is thoroughly perfumed with the pork lard oil and wine. The Sultan fish was fresh and sweet. Its flesh is firm and white. My only gripe is that it’s filled with loads of bones. We took quite a while picking at the bones carefully. The bones are not fine but it is still fairly small. I like it enough but I would prefer to order the Patin Buah to enjoy the silky smooth flesh without the bones. At the price of RM224 for this piece of Sultan, it is certainly an eye opener and I was glad I got to try this fish which is quite hard to catch and sought after. After we had this, then my uncle told me we should have ordered the head section to enjoy the fat belly of the fish and there is less bones in this section too. Other than the bones, I really enjoyed the fish with its cooking and flavoring method as the flavors really whet one’s appetite! There are plenty of fishes to try at Northern Claypot Seafood Restaurant. Besides serving special river fishes, there are also plenty of regular ones for those with fewer budgets. For me, it’s the sauce that takes the cake and I am happy downing the sauce with white rice. Our green vitamins for the night was a simply Sautéed Nai Bak. Crisp and crunchy, this was lightly cooked to retain textures. Flavors are clear and light. Eating here brings back lots of warmness. Flavors are home style with lots of light and delicate notes. Yes, one can really rake up quite a bill with its offering of upper stream fishes but there are plenty of simple and affordable dishes too. If comfort food from the north is your thing, then check out Northern Claypot Seafood Porridge for a taste of simple comfort food. Total damage for the night was RM327.50 (excluding abalone and top shell). Thank you sis! I love porridge, and my daughter too! Meat balls look good - like the ones my missus makes...but the condiments - not the usual that we have with porridge. its just really good to enjoy porridge at times...pure comfort bliss! 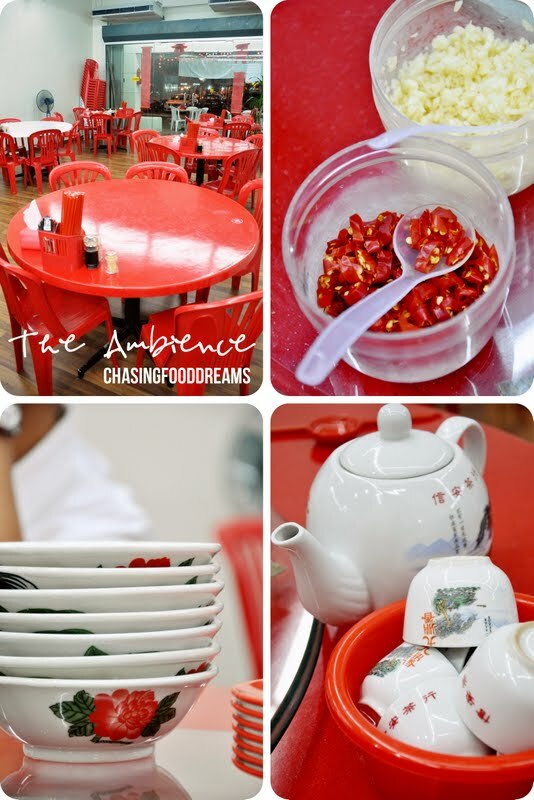 The condiments are Teo Chew style.... what condiments do you put in yours? The fish looks soooo fresh! Secret Recipe: RM1 Promotion for a Slice of Cake! Sin Yoon Loong, Jalan Timah @Ipoh: My Cup of Joe!